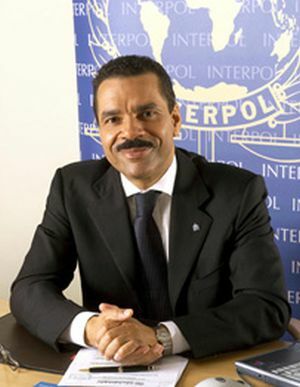 Ronald Kenneth Noble is the first African American to serve as Secretary General of the International Criminal Police Organization (Interpol) headquartered in Lyon, France. Born in 1956 at Fort Dix, New Jersey, Noble is the son of an African American soldier and a German mother. He is a 1979 graduate of the University of New Hampshire, earning a baccalaureate degree in economics and business administration and a 1982 graduate of Stanford Law School in California where he was the president of his graduating class and served as articles editor of the Stanford Law Review. Noble began his civil service career in Philadelphia, Pennsylvania serving as senior law clerk for the Honorable A. Leon Higginbotham, Jr., of the U.S. Court of Appeals, Third Circuit. In 1984, Noble was appointed as Assistant United States Attorney in Philadelphia, prosecuting drug trafficking and corruption cases. In 1993, he was appointed Undersecretary for Enforcement of the U.S. Department of Treasury. In this role, Noble provided oversight to the U.S. Secret Service, the Bureau of Alcohol, Tobacco and Firearms (ATF), the Federal Law Enforcement Training Center, the Office of Foreign Asset Control, the Financial Crimes Enforcement Network, the Executive Office for Asset Forfeiture, the U.S. Customs Service, and the Internal Revenue Service’s Criminal Investigative Division. As Undersecretary, Noble served as the American delegate to Interpol and served on its executive committee, increased efficiency of presidential security procedures, implemented the assault weapons ban executed by the ATF, and was credited for leading an investigation of the ATF’s raid on the Branch Davidian Compound in Waco, Texas. In addition to serving as Secretary General, Noble is married with one son and also serves as Professor of Law and faculty director of a scholarship program at the New York University School of Law. Maggie Paine, “The World’s Top Cop,” UNH Magazine Online, Winter 2002 http://unhmagazine.unh.edu/w02/noble1w02.html; "Ronald K. Noble" http://www.interpol.int/About-INTERPOL/Structure-and-governance/Ronald-K.-Noble; New York University, “Ronald K. Noble - Biography,” https://its.law.nyu.edu/facultyprofiles/profile.cfm?section=bio&personID=20172; “PUBLIC LIVES; The Long Days of Interpol's New Top Sleuth,” New York Times, July 13, 1999, http://www.nytimes.com/1999/07/13/nyregion/public-lives-the-long-days-of-interpol-s-new-top-sleuth.html.